Riding the Tour de France route has long been any cyclist worth their salt’s biggest dream. To skim your wheels along the very tarmac your heroes are about to race, to breathe in the surroundings of the world’s biggest sporting event, tops the list of ‘things to do before you die’. So when I discovered a tour company was offering that very experience, to ride two stages of the Tour de France through the heart of the Pyrenees, just before the race visited, I had to go. Although James is adamant that the trip is more of a holiday than a training camp, the ride which covers stage 14 and 15 (we only attempted stage 14) of this year’s Tour has attracted only cycling and fitness fanatics. It covers some of the more challenging terrain the Tour has to offer, so is a route suitable for regular cyclists who want to push themselves, with optional extras for more experienced riders. This group was using the route as a fun way to fit in some extra training, while sampling good French cuisine and taking in some stunning scenery. In the van ride on the way to our first night’s accommodation we passed through a landscape of green fields and sunflower crops dotted with little churches. I woke after a snooze to see dark clouds looming over what our hosts told us was the ‘Montagne Noire’. “It probably looks worse because of the weather,” chirruped an eager cyclist with a hint of trepidation. It looked more like a ‘bête noire’ to me. We eventually arrived in St Amans, a tiny village that apparently slaughtered all of its sheep the day before the Tour passed through, holding a massive feast in its honour. After a night’s stay in a comfortably rustic, two-star hotel, and then enjoying a calorific breakfast the group was ready to depart. The rain was pelting down, bringing looks of dismay to everybody’s faces as we started to grind out the miles. We wound along the main road with rain soaking our faces and pouring into our eyes, heading into Mazamet to see flowers planted in the shape and colours of cyclists in the yellow, polka dot and green jerseys. Abruptly we were into our first long climb on the Côte de Saraille. The gradient was ideal for breaking in our climbing legs for the gruelling gradients to come. After reaching the top, there was a gradual descent into the medieval city of Carcassonne. As we descended the landscape became more Mediterranean, with cypress trees and Mediterranean oaks dotted about, tufts of lavender in grassy meadows and a purplish haze just along the horizon. If we needed a further reminder we were in Tour de France country there was the odd monument to the Tour consisting of a pile of tarnished bicycles. As we arrived at the fringes of Carcassonne, plane trees lined the route, and there was a canal running alongside us. We stopped in the picturesque town for a slap-up meal to stock up on much-needed carbs. We took the scenic route to Quillan, our final destination for the day, through rolling hills and huge sunflower fields. After a feast of French cuisine we trooped off, happily full and slightly tipsy, to bed. Day two began after a night’s sleep broken by a local karaoke bar with an astoundingly bad version of ‘My Way’. But the sun was shining and we were keen to get going. The route became instantly beautiful as the road carved into the limestone face of a hill, which was covered with creeping greenery. We passed through quaint villages of peach and yellow houses with blue shutters and terracotta-coloured roofs. There were plenty other cyclists out on the road, pushing themselves to the limit. Then we began to climb the Port de Pailhères, the lung-buster of the day. As we ascended the winding road, the backdrop was stunning with the ruins of a Cathar castle framing the view. The higher we climbed, the colder it became and visibility soon became poor. The Toblerone-shaped mountains in the distance were covered in swirling fog. Halfway up the mountain, breathless and with burning legs, we arrived in Mijanes, a winter ski resort. This was where the caravans lining the route began and the first real signs of road decoration for the riders appeared. Back on the bike the gentle bends became steep hairpins. It became noticeably colder with each turn, and the misty clouds got thicker, blowing over us with increasing speed. Each time they cleared they revealed breathtaking views of the valley below. But something else was becoming crystal clear: there are no hills in the UK that can prepare you for the Pyrenees. Despite being a personal trainer, Andy Webb from Guildford was full of trepidation. “I knew I had to put a lot more in after Mijanes. It was the first time we were going to have to ‘dig deep’. Up and up and up we went. It was relentless,” he said. After a leg-shredding, gut-wrenching climb we made it to the top, where the view that greeted us was spectacular. There were lime-green mountains that looked like volcanoes with broccoli-coloured larvae spewing out down their sides. And fields sprinkled with purple heather, splashed with yellow buttercups. A makeshift bar offered solace to the weary before the descent into Ax les Thermes and Les Cabannes, our home for the night. The menu for the third day was quite straightforward. We had to climb the 1,020m to the summit of Beille, then stop to see the Tour ride through. The atmosphere was like a carnival, with campervans filled with people of all nationalities lining the sides of the road. There was a lot to see and encouragement around every corner because everybody was in a party mood. “It was a great feeling of achievement getting to the top, to the finish line where all the cars can’t go. It felt like we were getting the VIP treatment. They understand cyclists’ needs in France,” said Andy. Our hosts James and Cathy fired up a barbecue and we happily munched as we waited for the riders to arrive. “Watching the riders themselves was the highlight of the day, knowing they were just around the corner and could come into view any minute. With the crazy caravans and another 80 vehicles, it was like the Wacky Races,” said Simon Daniel, an accountant from London. Day one: St Amans (270m) to Quillan (290m) 105km; 634m ascent up Côte de Saraille (810m); 10km downhill to Mazamet (338m); 9km, 470m climb up Côte de Saraille (810m); 37km descent to Carcassonne (133m); 49km, 173m gentle ascent to Quillan (306m). Day two: Quillan (290m) to Les Cabannes (540m), 85km; 135m gentle climb Axat (425m); 19km, 350m gentle climb Usson les Banes (777m); 17km, 1,224m ascent to Port de Pailhères (2,001m); 18km descent to Ax les Thermes (720m); 16km gentle descent to Les Cabannes (540m). Day three: Plateau de Beille 16km and 1,260m ascent; 16km descent to Les Cabannes. 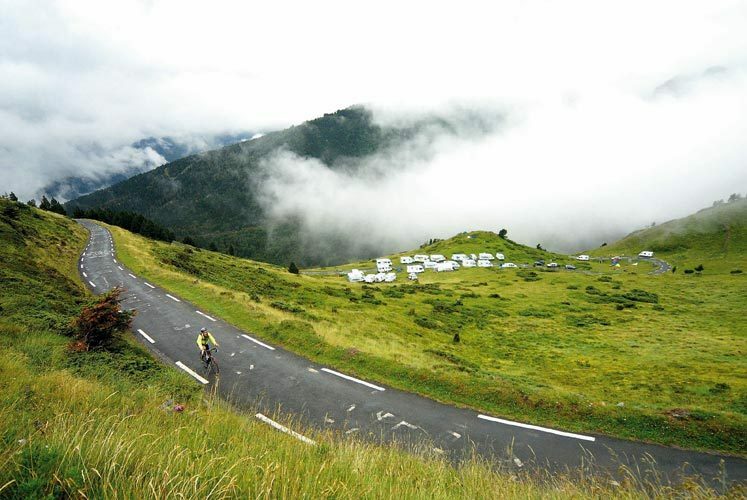 TO book a trip on next year’s Tour de France route with Marmot Tours or to sample another of their action holidays go to www.marmot-tours.co.uk or call James Thompson on +33 6300 11298. Flights from London Gatwick to Toulouse with British Airways cost around £70 return, www.ba.com.